The Diagnostic and Statistical Manual of Mental Disorders, which is written by the American Psychiatric Association, is the standard used in the medical community for the diagnosis of all mental illnesses. The book is commonly referred to as the DSM-5, a combination of the abbreviation plus an indication of the most recent fifth edition. The DSM-5 is regularly cited in caselaw in support of evidence about a person’s mental state. Recent cases have cited to the DSM-5 for many mental disorders, including sexual disorders, intellectual disabilities, PTSD, depression, anxiety, gambling disorders, and autism spectrum disorders. 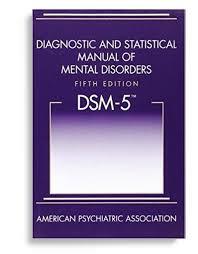 The DSM-5 is also discussed regularly in legal practice materials and law review articles. If you have any interest in psychiatry or psychology in general, it can make for some fascinating reading material and can be fun to browse through. A copy is located in Reference at RC455.2 .C4 D536 2013.